U.S. stocks ended sharply lower last Friday, capping the three main domestic indices with their worst weekly decline in over two years amid uncertainty over a potential trade war with China. Investors were also vexed over by higher borrowing rates which, together with retaliatory trade tariffs, could hinder economic growth. This second wave selloff was sparked by President Trump’s Thursday announcement of 25% tariffs on at least $50 billion worth of targeted Chinese imported goods and the swift retaliatory response from China. Chinese officials said that if trade negotiations fail, they will respond with tariffs on around $3 billion worth of American exports and threatened to trim their holdings of U.S. Treasuries. Markets largely shrugged off positive economic data and Trump’s signing of a $1.3 trillion omnibus spending bill that averted another government shutdown. The S&P 500 retested prior lows, bouncing off its 200-day moving average, coming within 0.2% of its February 18 low, and ended the week 9.9% below its January 26 all-time high. For the week, the S&P 500 lost -5.93%, the Dow Industrials shed over 1,413 points (-5.66%), and the MSCI EAFE (developed international) -2.58%. 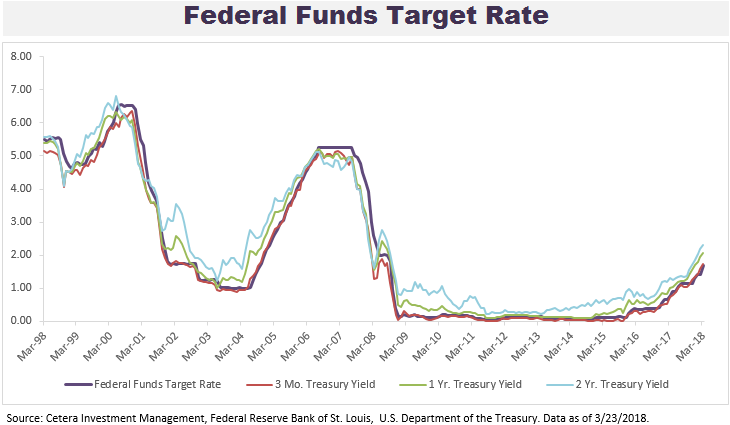 At last week’s Federal Open Market Committee (FOMC) meeting, the Federal Reserve increased the target federal funds target rate by 25 basis points (0.25%), pushing the total number of interest rate hikes in this cycle to six. As shown in the Chart, the Fed kept interest rates near-zero from late 2008 through late 2015. At last week’s March FOMC meeting, the Fed also increased their target year-end GDP forecast from 2.5% to 2.7% and kept inflation expectations at 1.9% for both core and headline inflation this year. At this time, two additional rate hikes are expected in 2018, but there is an outside chance that additional rate hikes may be implemented if economic growth or inflation rise faster than the Fed’s expectations. The impact of Fed policy on short-term bonds is evident in Chart 1. Three-month Treasury yields move in tandem with the Fed’s target interest rate, while the 1- and 2-year Treasury yields move slightly ahead of interest rates. We anticipate bond yields at the shorter end of the curve to continue to rise as the Fed normalizes interest rates. The movement in yields at the longer end of the curve will likely be more subdued, barring an unforeseen sharp rise in growth or inflation. As result, we expect the yield curve to flatten somewhat in the coming months.